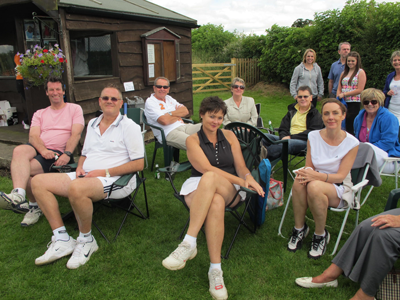 Thorp Arch Lawn Tennis Club (TALTC) was founded around the time of the Queen’s Silver Jubilee in 1977 by members of the village on land donated by the LEH Trust. We have a newly refurbished all weather court in the heart of the village. We are situated just opposite the Pax public house, down the lane marked as a public footpath, which many villagers use for dogwalking. We are just through the five bar gate. Membership is open to all members of Thorp Arch who wish to enjoy its facilities. Family membership is £45 per year, adults £25 and students/children only £10 each. Guests can play with you for a nominal fee of £2 per game. Fees are used for professional upkeep of the land around the court and for maintenance of the court. We have spent over £10,000 in recent years. Membership enquiries to the Chairman or Secretary in the first instance. Guest fees to the Treasurer at 13 The Village. We have a yearly American Tournament and Barbecue held at the court usually in July. This has a mixed doubles round-robin format and is a relaxed and fun day. Only tennis shoes permitted on court. Please pass on guest fees to the Treasurer. No bicycles to be ridden around the court. Please ensure that your dog does not foul the area around the court. Nothing of any value is kept in the hut. No cash. No alcohol. No tools. Once or twice a year we have a social event. For each of the last few years we have had FilmFest evening at the village school, a barbecue and a singalong film for the family. The last few years have seen Mary Poppins, Sound of Music, Mamma Mia! and Oliver! We encourage fancy dress and singing along to the subtitled film – always great fun. We also hold fundraising food and wine evenings.